To use groundwater we need to reach it. The simplest way to exploit groundwater is to wait till it comes to the surface as a spring, and capture water at this point. Spring sources are widely used, and are often ‘improved’ by building channels to protect the supply and lead it to a convenient watering point. 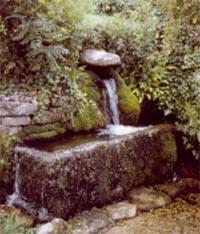 A simple alternative to a spring is a well, used when groundwater is close to the surface. A well is normally a vertical shaft, wide enough to allow access for a man to dig. It may be excavated by hand or with simple machinery. Deeper waters can be exploited by drilling a borehole; these tend to be smaller diameter than a well, and are drilled using a drilling rig. There are many different designs of rig, but they commonly use a mechanically operated chisel to break up the rock and water or air to flush the chippings to the surface. Confusingly the two words, well and borehole, are often used together or interchangeably. To raise groundwater to the surface we need to pump the water up from the well or borehole. Much of the early technological development of steam engines in Britain was driven by the need to find efficient ways of pumping water from mine shafts, and in Victorian times groundwater pumping stations were often ornate buildings housing magnificent beam engines. Today pumps are usually electrically driven, and by installing the pumps and their motors in the well or borehole, no surface buildings are required.